Welcome to the Meshaw Village website. To see what's changed recently look here. Meshaw is a small village in the rural parish of the same name in North Devon. It is listed in the Domesday Book (1086) under the name Mauessart. 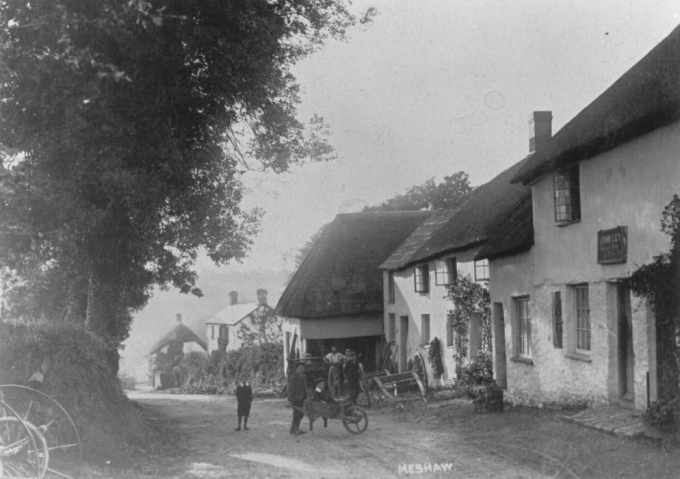 "MESHAW is a small village, at the foot of a declivity, nearly 6 mile S. by S.E. of South Molton, and 14 miles N.W. by W. of Tiverton. Its parish increased its population from 166 in 1831, to 305 in 1841, and comprises 1770 [acres] of land [...] It is a hilly district, over which a new road was cut about ten years ago. [...] In the village is a National School, and on the Moor is a school and chapel belonging to the Bible Christians, built in 1839." If there's anything you would like to see on these pages please contact the webmaster. If you have any objections to a picture on this website, please let the webmaster know which and why.